I spent a lot of time in Eastern Kentucky growing up, it’s where my paternal grandparents, Aunt and cousins lived and where we spent vacations no matter where else in the country (or elsewhere) we were living at the time (Navy brat). I’ve no more relatives there, the last of them died a decade ago and none of us siblings chose to live there for raising our own families or even retiring in our old age. I do recall several very nasty UMW strikes in the mining region around Harlan, and I recall the black moonscape on the Green River near Paducah’s western shipping point that stretched as far as the eye could see in all directions, the coal tailings having turned a lovely rolling greenscape into utterly depressing nothing. I also recall learning to shoot my father’s beautiful pearl-handled six-guns at the abandoned strip mine near Laurel, and one touristy adventure in a no longer operating underground mine where we rode through in one of those little coal rail cars as if it were an amusement park ride. These days they do things a little differently, as the deep seams get harder to work (and miners become more rare, having been decimated by Black Lung) and the easy seams have all been stripped. Now they’re going for the mid-seams, the last of the stored coal, by simply blowing up the entire mountain to get to it. It’s called Mountaintop Removal mining, and it’s utterly devastating the southern Appalachians in the traditional coal mining regions of Tennessee, Kentucky and West Virginia. It’s a horror even worse than Mister Peabody’s tailings outside Paducah. It’s destroyed ~500 whole mountains so far, it’s polluting mountain streams that contribute to the primary water supplies for millions of people downstream, and it’s killing the abundant biodiversity these mountains are so very famous for. Most of all, for those of us who dearly love these gorgeous mountains, it’s very, very tragic. Some of the mines are as big as the Island of Manhattan. When growing up with strong ties to Kentucky, I learned from my Aunt – a state social worker – that King Coal was an “economic boom” to the people who traditionally made their means by doing things for themselves with what the mountains provided. Yet what I saw was crushing poverty, Black Lung, and a hopeless generation of young people who couldn’t wait to get as far away from their family’s traditional homesteads as possible. It’s not like the miners and their families got any of the great wealth King Coal brought to the mining companies, their stockholders and the industrial consumers of the coal taken out of their ground. When my family determined to move back to the land 16 years ago to see if we could re-invent self-sufficiency and commune with nature instead of a million-plus other humans in immediate proximity, we chose Western North Carolina instead of Kentucky. Or Tennessee. Or West Virginia, or even Virginia (the most perfectly beautiful and well-maintained state in the union, IMO). We chose it for being Appalachia and beautiful (tourism is our largest industry), for more sophisticated residents and politics, for then-reasonable land prices, and for not being enslaved to King Coal. But alas, this is the land of Duke Energy, and a thriving piedmont and coast full of large energy consumers. Turns out that North Carolina is the #1 consumer of coal mined by means of Mountaintop Removal. Thus I was greatly pleased when the NC State Legislature introduced a bill in May of 2008 to ban the use of coal mined by this method within the borders of our beautiful state! There will be a lengthy legislative fight over the bill, but hope in the very fact that we did get a law back in 1983 banning development on high ridge lines – thereby destroying the mountain views from which a majority of residents make their living. Because the mountains are a gold mine simply for their beauty, there is strong incentive to keep them beautiful. 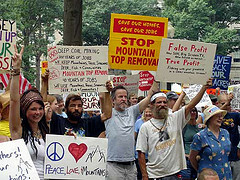 I realize that many or most of my readers don’t live in these mountains, but any of us who love the land and work hard to make our way lightly on this earth should get to know about how desperate the corporate evil-doers are to squeeze (and blast) the very last drop of profit from the earth, not caring how much irrevocable damage they do to it in the process. Educate yourself about the issue by perusing some of the great links below. Write to your state and federal representatives about your concerns, talk to activists about how to ban the burning of this ill-gotten coal in your state, and support some of these efforts to save the mountains. Please! If there is no market for this coal, King Coal has no reason to destroy the mountains. Previous Previous post: MTR: Big Win for the Good Guys!! !